It’s odd how dreams are conceived and misplaced. Joan Didion’s first novel, Run River, was published in 1963; it’s the same year Sylvia Plath killed herself. Sometimes I think of how Plath’s dreams must have disappeared the day she decided to end her life and at the same time, somewhere across the Atlantic, Didion might have been reading proofs with notes from her editor; she was looking forward to realising a dream as someone else’s ended. I wonder how dreams die so suddenly, beyond the mental illness, something happens in society that breaks us. 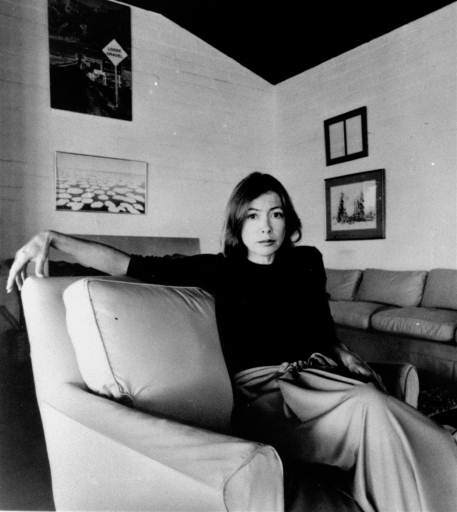 How did Didion avoid rejection and self doubt? Maybe she hid it beneath the cool girl aesthetic or she was stronger than the others? Plath didn’t live long enough to create the narrative she would have wanted. Culturally Plath will always be framed as the wronged housewife and poet who struggled to divide her time between writing and caring for her young family. Feminists often cite her as the victim of domesticity. Plath became a martyr for the feminist movement and many view her poetry is a symbol of the domestic struggle. If Plath is a martyr, Didion becomes harder to place; perhaps she is Athena. A literary icon, Didion began her career at Vogue in 1956 and her groundbreaking essay ‘On Self Respect’ is published five years later; it’s a path without crushing disappointment. She forged along and became an icon. It sounds effortless, although I’m sure it wasn’t. With Plath there were struggles and fears of failure, her early poems were published in Harper’s Magazine (1954); but she often expressed disappointment with rejection. I’m not sure why it matters that Plath struggled, but for some reason it does. Their lives were drastically different. Plath studied at Cambridge on a Fulbright, she married poet Ted Hughes; ultimately, they settled in Devon after spending some time in the United States. Didion married novelist John Gregory Dunne and they moved to Didion’s native California, her essay, ‘Goodbye to All That’, describes her decision to leave New York. What seems clear is Didion made decisions about her future that many young wives weren’t afforded. Plath’s diaries suggest her husband’s desire to return to England, not hers. Some part of Plath embraced society’s expectations of the domestic housewife, but scholars point to her poems as evidence of the writer’s resentment. Plath’s narrative is always evolving, picking apart her life through the Ariel poems leads to a generational reframing. I look around and see remnants of ‘The Yellow Wall-Paper’, it’s a post modern silencing, but it is a silencing of women, nonetheless. Times have changed and yet so much is the same; yes, women have a great deal more since Gilman’s story was published, but there are still short lived careers abandoned after marriage or upon the birth of children. When friends tell me they’ll return to work once their child is older, I often wonder if they are unconsciously reassuring themselves. Depending on the company, it’s unlikely they would be welcomed back and they know this, after all they made strides because their female colleagues left after having children. It’s a choice now, but I wonder if societal pressures remain the same. Plath’s representation of motherhood has never been clear, it doesn’t seem fair to label her as an oppressed woman forced to care for two young children; although it is frequently done in college classes. Didion offers a more clear answer, she spent weeks in San Francisco only returning home to Los Angeles on weekends, such a modern arrangement for a wife and mother during the 1960’s. She was seemingly free of social pressures, yet Blue Nights implies Didion regrets leaving her daughter alone. I’m not telling you to make the world better, because I don’t that progress is necessarily part of the package. I’m just telling you to live in it. Not just to endure it, not just to suffer it, not just to pass through it, but to live in it. To look at it. To try to get the picture. To live recklessly. To take chances. To make your own work and take pride in it. Didion struck me as a mythical creature, far too detached to feel, let alone express remorse. Maybe all women in the 1960’s were secretly escaping The Yellow Wall-Paper, the young married woman whose controlling husband insists she stay in the country on a ‘rest cure’ and forces her to spend every moment with their baby. Plath’s novel, The Bell Jar, is a subtle examination of female madness and the medical treatment women received by male doctors. I lost my copy of ‘The Yellow Wall-Paper’, but I remember quiet rebellion that took place.